On November 20, 2014, Crawford, Murphy & Tilly, Inc. (CMT) was officially recognized as the 2014 Design Firm of the Year at a ceremony sponsored byENR Midwest, a publication covering the civil engineering industry. The event was held at the Westin Michigan Avenue Hotel in downtown Chicago. The award presentation included a video featuring several CMT projects that highlighted the firm’s capabilities and innovative solutions. Dan Meckes, CMT president and CEO, accepted the award on behalf of the firm. He credited the firm’s success to both the hard work of its employees, and the loyalty of its many clients. 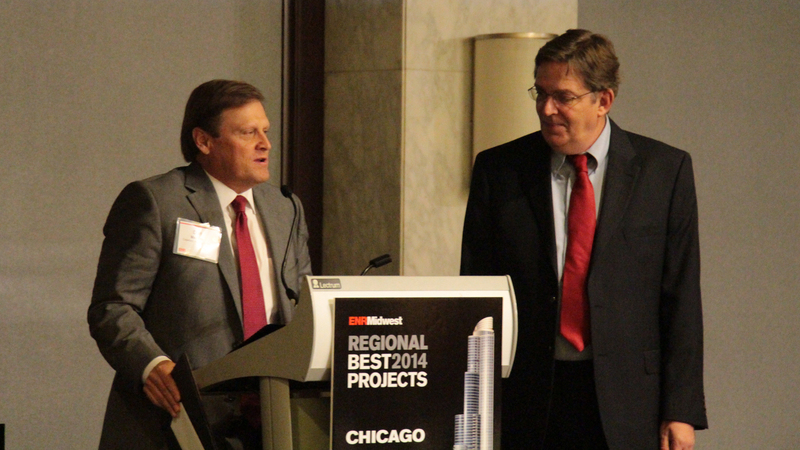 Meckes also expressed his gratitude to ENR Midwest for the Design Firm of the Year honor. “ENR does a great job of shining a light on the achievements in our industry. We are certainly proud to be a part of this year’s event,” Meckes said. CMT was the subject of a feature story in ENR Midwest this past May when the Design Firm of the Year announcement was first made. The award was presented at the publication’s annual ceremony that honor’s the top 20 projects in the region.